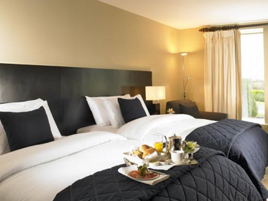 The four-star, Horse & Jockey Hotel offers great food and hospitality in the home of Irish Racing, culture and GAA: Co. Tipperary. The family-owned and run Horse and Jockey is a four-star hotel with 68 bedrooms, a renowned conference facility, excellent and varied dining options with outstanding Leisure Centre and Elemis Spa. Home to The Enclosure Bar, Silks Restaurant, Gourmet Cafe/Bakery, 68 bedrooms, Derrynaflan Theatre, Elemis Spa & Leisure centre, The Gift Horse Gallery and award-winning in-house Bakery and Patisserie. FREE WIFI throughout the hotel too.